What Is the Cost of Living in Los Angeles? From the mansions of Beverly Hills to the hipster bars of Silver Lake, LA charms visitors to its palm tree-lined streets. But if you’re pondering becoming a resident you’ll want to get a handle on the true cost of living in the City of Angels. Will your income provide you with enough money to live in Entourage-style splendor? Find out with our guide to the cost of living in Los Angeles. In the last five years, sale prices on LA homes have appreciated 78.5%. Though the LA housing market took a hit during the Recession, it now looks to be going strong. That’s great news if you already own a home in LA and you want to stay put or refinance. For first-time homebuyers, though, the LA market can be tough to break into. 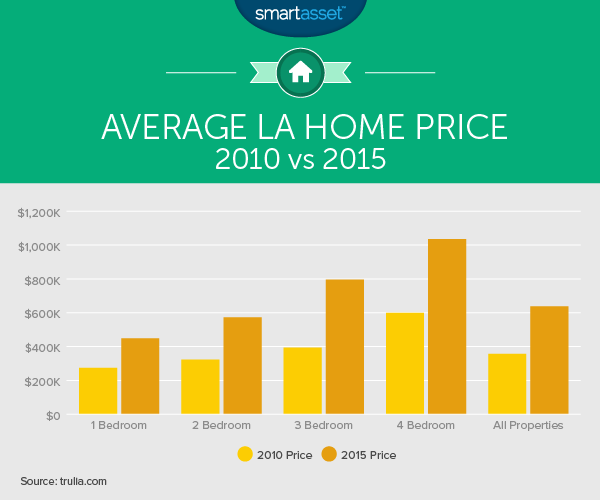 Take a look at how home prices in LA have been climbing. Then check out our California mortgage calculator to see how much a mortgage may run you in the Golden State. As far as year-on-year growth in home prices, LA lags behind its pricey neighbor to the north, San Francisco. Between 2014 and 2015 housing prices climbed 11.3% in LA, compared to 20% in San Francisco. Still haven’t decided whether you should rent or buy? Let’s take a look at the rents in LA. According to myapartmentmap.com, the average rent on a one-bedroom LA apartment is $1,949. That’s almost twice the national average rent for a one-bedroom, a mere $977. Need two bedrooms in LA? Expect to pay around $2,846. Compare that to the national average two-bedroom rent at $1,196. The LA price is a whopping 137% higher. Of course, renters should expect to pay higher prices in the fancier neighborhoods of LA and to look for bargains in neighborhoods that haven’t yet made it big. Want to really save on rent? You may consider moving outside of the city. The average rent on a two-bedroom apartment in Bell, California is $1,315. That’s a big price difference for a roughly six-mile difference in location. If you’re looking for a mortgage or bank in L.A., we’ve outlined some of the top banks in the city. Once you’ve decided where to live you’ll need to set up utilities for your new abode. The basic monthly utility bill for a 915 square foot apartment in LA is around $110.71. 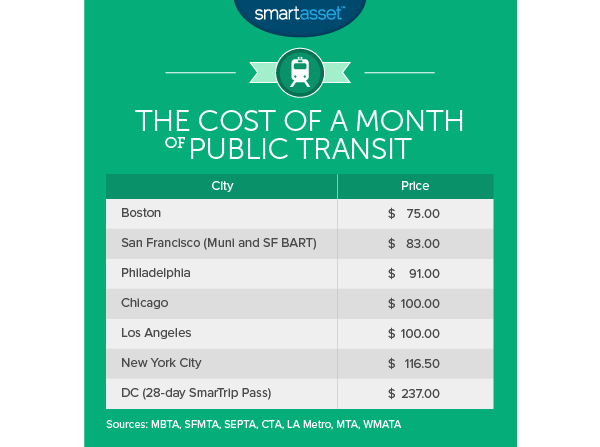 That’s cheaper than Chicago ($122.38) and New York ($130.44) but more expensive than San Francisco ($106.58). Compared to New Yorkers, Angelenos enjoy much cheaper internet. A month’s worth of internet will cost you $39.50 in LA compared to $60.27 in the Big Apple. Lots of us think traffic when we think LA. Driving around in cars seems like an integral part of the Los Angeles experience, as seen in some of the city’s most iconic films. Think Cher learning to drive in Clueless or the Dude in The Big Lebowski crashing his car in spectacular fashion. Unfortunately, LA gas prices make being stuck in traffic all the more painful. According to gasbuddy.com, the average price of a gallon of gas in LA in July 2015 was $4.29. That’s almost 55% higher than the national average of $2.77. Although LA traffic is famously bad, Angelenos don’t actually have the longest commutes in America. That honor goes to SmartAsset’s hometown, New York City. The LA food scene just keeps getting better. From food truck tacos to upscale farm-to-table fare, LA has foodies covered. According to Numbeo, the average cost of a mid-range meal for two people at an LA restaurant is $56. That’s $11 above the national average. A cappuccino in LA will set you back $3.89. Not terrible considering the national average price is $3.72. California wines and produce are deservedly famous, but does that mean they’re priced out of reach? Nope. The’re an opportunity for saving money on food in the produce aisle. A pound of tomatoes in LA will cost you around $1.44, well below the US average of $1.78. Apples, oranges and potatoes in LA all cost less than the national average. A mid-range bottle of wine to go with your meal will cost you $10. That’s two dollars under the national average. Score! Want to see a Primary Care Physician (PCP) for a routine visit? According to Castlight Health you should expect to pay around $121. That’s less than in the state capital of Sacramento ($219) and in ultra-expensive San Francisco ($251). A visit to a PCP is also cheaper in LA than in Boston ($193), Portland, Oregon ($216) and Chicago ($165). Now that you know how much the basics will set you back, let’s talk about the cost of extras in LA. It shouldn’t come as a surprise that LA prices tend to be higher than the national average. A movie ticket that would cost $10 in an average US city will run you $13 in LA. A pair of men’s leather business shoes will cost around $102.25 in LA, compared to the national average price of $86.42. That’s a mark-up of a little over 18%. Don’t forget to take sales tax into account. The baseline sales tax in Los Angeles county is 9% but some places, including Santa Monica and Culver City, have rates of 9.5%. That 9.5% is on par with the sales tax in Seattle, but far higher than the sales tax in Portland, Oregon, which boasts no state or local sales tax. And in other Los Angeles cities such as La Mirada and Pico Rivera, sales taxes top 10%. The LA lifestyle doesn’t come cheap, but the sunshine and avocados can make up for a lot. 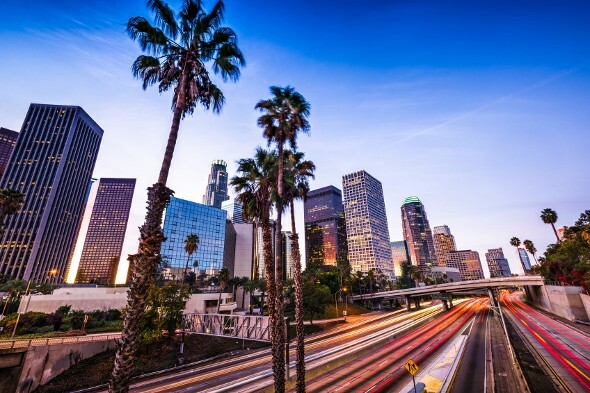 If you’re thinking about moving to Los Angeles, it can be helpful to know how the change will affect your budget so you can plan accordingly. If you’ll be starting a new job, your paycheck may end up looking quite different than it does now. Try using our California paycheck calculator to estimate what your new take-home pay will be.